515 Items. Showing Items 436 thru 450. Fits a 14x12.0mm emerald shaped stone (stone not included in price but available as an optional purchase). Cast per order in 10k yellow, white or rose gold, 14k yellow, white or rose gold, 18k yellow, white or rose gold, palladium or platinum. Fits a 16x12.0mm emerald shaped stone (stone not included in price but available as an optional purchase). Cast per order in 10k yellow, white or rose gold, 14k yellow, white or rose gold, 18k yellow, white or rose gold, palladium or platinum. 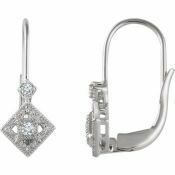 Fits a 18x13.0mm emerald shaped stone (stone not included in price but available as an optional purchase). Cast per order in 10k yellow or rose gold, 14k yellow, white or rose gold, 18k yellow, white or rose gold, palladium or platinum. Fits a 6x4.0mm, 7x5.0mm, 9x7.0mm, 10x8.0mm, 11x9.0mm, 12x10.0mm, 14x12.0mm, 16x12.0mm or 18x13.0mm emerald shaped stone (stone not included in price but available as an optional purchase). Cast per order. 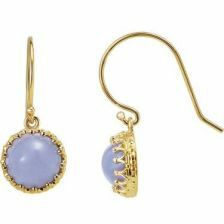 Crown bezel frame dangle style earring settings in two sizes for 8 or 10mm round cabochons. 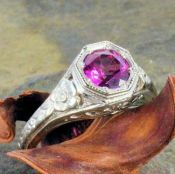 Sold as settings only, gemstones are optional. Fish hook ear wires included. Crown bezel frame dangle style earring settings in two sizes for 8 or 10mm round cabochons. 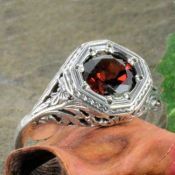 Sold as settings only, gemstones are optional. Fish hook ear wires included. Available in 14k yellow, 14k white or 14k rose gold. 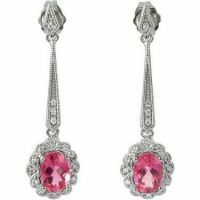 Elegant Art Deco style drop semi set earrings for a 7x5mm oval shaped gemstone accented with .13cttw diamond accents. 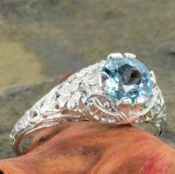 Gemstone available as optional purchase. 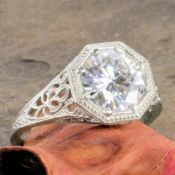 Filigree octagons that fit 2.0 mm round stones or .03 carat diamonds. Sold by the pair as blank settings, gemstones are optional. Available in 14k white or 14k yellow gold. 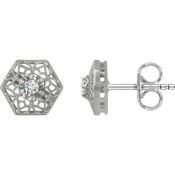 Filigree octagons that fit 3.0 mm round stones or .10 carat diamonds. Sold by the pair as settings, gemstones are optional. Available in 14k white or 14k yellow gold. 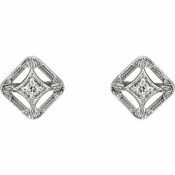 Square shaped open work embossed earrings earrings that fit a 2.0mm round gemstone or .03 carat diamond. Sold by the pair with friction backs included. Available in 14k white or yellow gold. 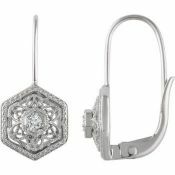 Filigree octagons that fit 2.0 mm round stones or .03 carat diamonds. Sold by the pair as settings, gemstones are optional. Available in 14k white or 14k yellow gold. 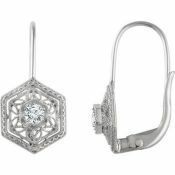 Diamond shaped open work embossed earrings earrings that fit a 2.0mm .03 carat and a 1.8mm.02 carat round gemstone or diamond. Sold by the pair with friction backs included. Available in 14k white or yellow gold. 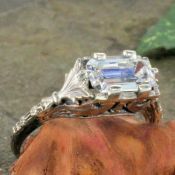 5.0 to 5.5mm semi set engagement ring for a .50 carat round diamond (center stone not included) with diamond accents. 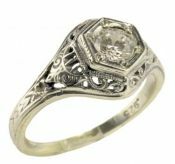 6.0mm semi set engagement ring for a .75 carat round diamond (center stone not included) with diamond accents. 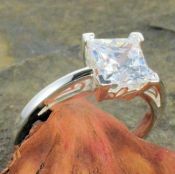 6.5mm semi set engagement ring for a 1.00 carat round diamond (center stone not included) with diamond accents. Available in 14k white or 14k yellow gold.